When you first log into Etudes, you will be on your Dashboard. It allows you to see activity in all your Dashboard sites. = 2 people are online in the course site. = There are 17 new posts in your discussions area. Students do not have the early alert indicator. Instead, they see how many graded assignments they have not reviewed. 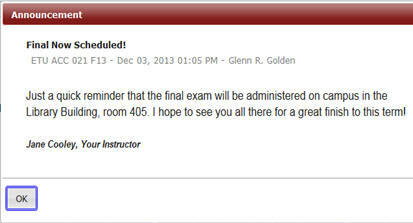 = 3 assignments have been graded; you have not yet reviewed your instructor’s feedback. Your first 12 sites selected for your site tabs are included on your dashboard. Status information, dates, and the most recent announcement from each site are displayed. To change which sites are displayed on your dashboard, click on the “Edit” icon of the Dashboard (top right). A window will open listing the sites that you have in your Tabs, and perhaps ‘Other Sites’ on the left area. Use the up and down arrows to order your sites. To remove any sites from your Dashboard and your tabs, use the side arrows and move them to the ‘Other Sites’ window. You can always visit your ‘Other Sites’ by clicking on My Sites at the top menu bar of MyEtudes. You can also customize your tabs by clicking on Preferences at the top menu, and then on Edit by the Sites in Tabs section. 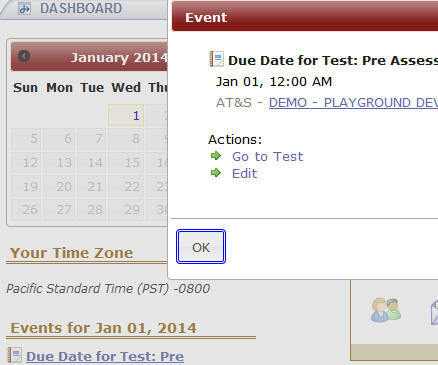 The calendar lists open and due dates across all courses that are included on your Dashboard. The calendar lists open and due dates of modules, assignments, tests and surveys, and gradable discussion items, and any events that you may have added to the course schedule. Click on any date that is a hot link to view items that opened or are due to get a list of events. You can distinguish what type of item is due by the icon and reference used (i.e. AT&S, Modules, or Discussion). The items that are open or due are hot links, and you can click on them for more details or to go directly to them. 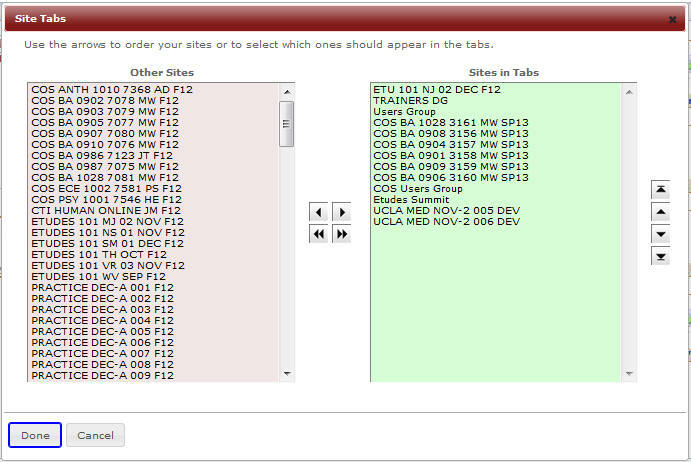 Instructors can go to an item to view it or to edit it (see screen shot below). 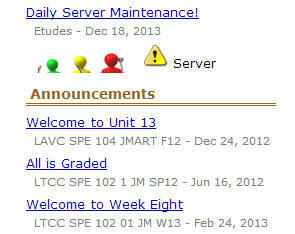 You may also click on the course title to go to the class home page. 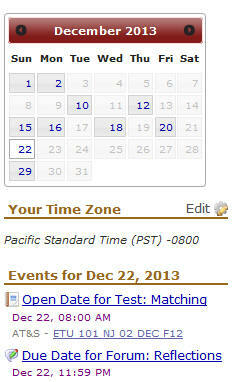 Below the calendar, you can also see the current time zone of the open and due dates. 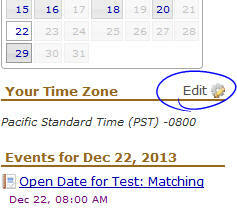 If you are taking a course from another state or part of the world, click on Edit to change your time zone. This will adjust all the open and due dates to reflect your new time zone. On the far right of Dashboard, you will see system announcements and global course announcements from all your Dashboard sites. The top section of the announcements area is reserved for Etudes staff to post important system information. Click on the hot link of the title of the announcement to read it, without having to go to the course.